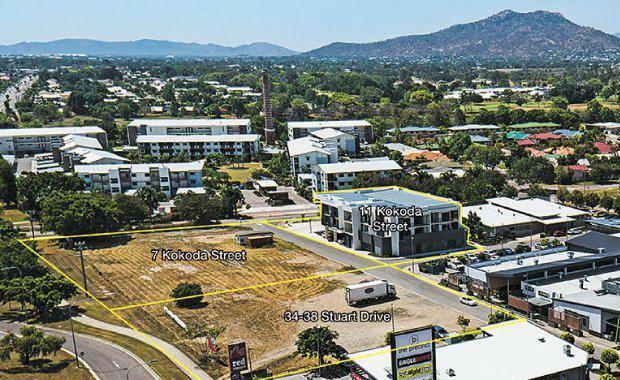 Opportunities to invest in the hugely successful and award winning master-planned Fairfield Waters development in northern Australia’s largest city of Townsville are available through Ray White Commercial and Colliers International. Following their $22 million sale of The Precinct, the Brisbane-based owner has appointed Stephen Kidd of Ray White Commercial Qld and Neville Smith of Colliers International to also sell three more projects in the Fairfield Waters estate in Idalia. The commercial and residential offerings include 7 Kokoda Street, a property comprising almost 4000 sqm of land which is zoned for a seven-storey mixed use development. Also offered for sale is 11 Kokoda Street, a new mixed use tower on a 2,275 sqm block. The residential component is already fully leased and several of the stylish apartments are furnished to boost their potential rental income. The ground floor of the building has three retail shops, two which are leased. The third property, 34-38 Stuart Drive, is 3151 sqm of land and with Development Approval (DA) for another mixed-use development. The site is approved for 24 residential units and 643 sqm of retail space. These three outstanding properties are being offered for sale via Expressions of Interest in one line but they can be sold individually. Neville Smith said the lakefront Fairfield Waters Estate has been an exceptional performer in the Townsville market. “The greater Fairfield Waters Estate is in a league of its own in Townsville,” he said. Expressions of Interest close at 4pm on Thursday, July 20, 2017.